As I said last month, after watching about ten minutes of an episode of "Hoarders," I stopped saying that I hoard books. Nope. Not me. I stockpile them. And I'm a neat stockpiler. There are no stacks of books on flat surfaces or on the floor. All my books-- with the exception of the one I'm currently reading-- are on my bookshelves, and my bookshelves are not double-stacked. Once a librarian, always a librarian no matter how many years it's been since I was last paid for shelving books! With the eye problems I've had, I've turned more and more to eBooks, and although eBooks do help reduce the urge to stack books, I have to admit that it's easier to forget all the gems I have on my Kindle. At least I have them all categorized by collection, so when I feel like non-fiction or short stories or historical mysteries, I can just turn to that tab. 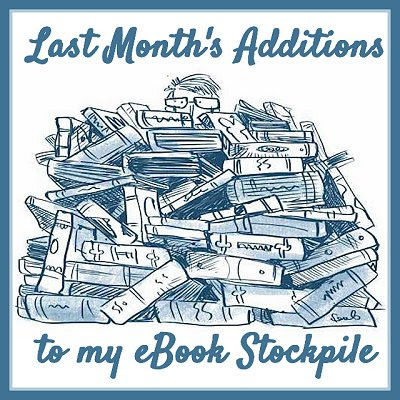 Here is my list of the eBooks I added to my Kindle during the past month. I've grouped them by genre and included a link to Amazon (or my review) in case any of the titles intrigues you. Once I finish the eBook I'm reading now, I'll find myself in a quandary. Should I read Under the Coconut Tree... or Jane Steele... or Miss Blaine's Prefect and the Golden Samovar? Decisions, decisions! Have you read any of these? What did you think? You know that inquiring minds would love to know! Oh, you've got some great ones there, Cathy! I really like your selections. And one thing I like about the Kindle is that it's easy to store, and harder to be confronted with the number of books one's stockpiled. My physical bookshelves are pretty packed as it is, so the Kindle really helps out on that score! Wasn’t Up the Down Staircase a movie? The title is 100% familiar, but in a cinematic way. Yes, Up the Down Staircase was a movie (1967, starring Sandy Dennis) that was based on Bel Kaufman's book. I read Up the Down Staircase because of the title. It was something my dad always said! I'd heard it, too, but I can't remember where!